Eating with the seasons has many health benefits. In my post, The Energetics of Fall, I talked about living with the energy of autumn – this includes eating foods that are harvested during this season. A few of those foods are listed below. As you will find, many of these foods are moistening and benefit the lungs. And that is what is interesting about following the energetics of the seasons: in Chinese Medicine, the season of fall is associated with the lungs and with dryness. Energetically, these foods benefit the lungs and help to moisten the tissues of the Lungs and respiratory system. It also helps that all of these foods are really delicious as well. Enjoy! This little under-used fruit is a wonderful and healthy addition to your fall diet. 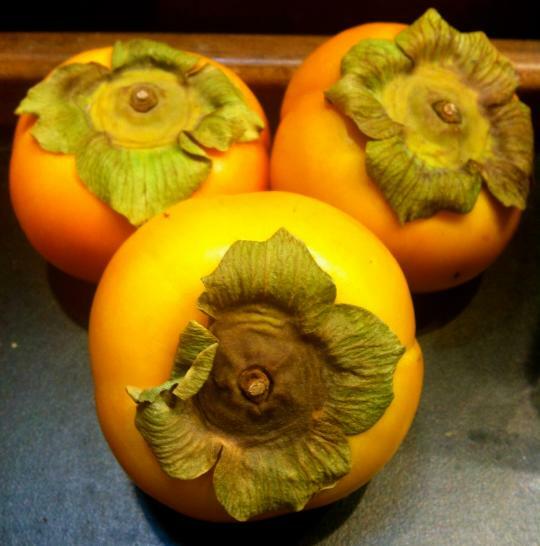 The persimmon is not well known, but it is healthy and delicious. Unfortunately, they are not found in too many markets, but Whole Foods is carrying them right now. Along with the crispness and coolness of the fall air that so many of us are fond of, fall air is generally drier as well. This dryness is amplified as we turn on our heaters. We may find that we need to do more for our nasal passages and throat to keep them nice and moist than just drink more water. Persimmons are one fruit that can help. It is cooling in nature and also moistening. It helps to build body fluids and can help to treat hot and/or dry conditions such as thirst, canker sores, and chronic bronchitis, especially bronchitis or lung conditions that get worse during the fall and winter months. Pumpkin seems to be a favorite for fall, from decorations to food to flavoring. In fact, one can’t really seem to get away from it (is that such a bad thing – I don’t really think so…). But did you know actual pumpkin has many health benefits as well? Pumpkin is cooling in nature and is another fall food that benefits the lungs. Regular use has been shown to help bronchial asthma. It has mucus discharging properties and can help to clear mucus from the lungs, bronchi and throat. Pumpkin is also beneficial to those with diabetes and hypoglycemia because it helps regulate blood sugar levels. Sweet potatoes and yams show are often a staple side dish at Thanksgiving, but they are a healthy and delicious food that can be integrated more often at your table throughout the fall season. Sweet potatoes and yams are cooling and sweet in nature. When eaten in moderation, they can help to strengthen the digestion and increase energy (but eating too much can have the opposite effect!). Sweet potatoes and yams also help to moisten the body, which can be helpful during the dry fall season. Pears are another fruit that is common this season. Pears and pear juice are often one of the dietary recommendations that we often give to people that are experiencing dryness in the form of dry cough, chapped lips, and dry skin. Especially effective are baked pears. Not only are they delicious, but they really help to moisten the body. Pears are cooling, sweet and slightly sour. Because they are moistening, they are another great fruit that will help protect your lungs and throat from the dryness of heaters and cool fall air, and they also help to curb thirst. You know it’s fall when you begin to see the vast varieties of apples at the market. 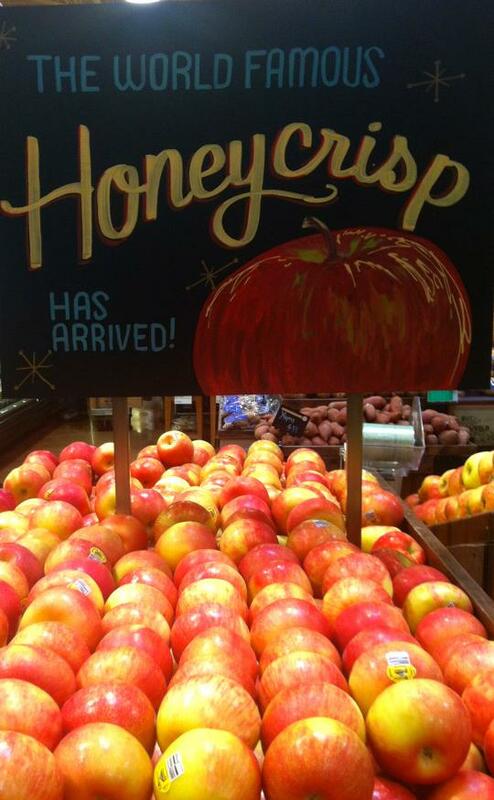 My favorite is the Honeycrisp apple. Crisp, sweet, and juicy – they are the one variety I look for every fall. Apples are also another versatile fruit that shows up in pies, salads, main dishes and delicious apple cider. And fortunately for us, they are also really healthy. Apples are cooling, sweet and sour. They are another great fruit to combat dryness and heat in the lungs (pay attention, smokers: they can help protect your lungs). Apples help with indigestion as well as low blood sugar. They also contain pectin, which helps to remove cholesterol, toxic metals, and some residues of radiation. An apple a day? Sounds good to me. Hope you enjoyed learning more about some common and not-so-common fall foods! Cough, dryness, allergies, and common colds can all be treated with Chinese Medicine and acupuncture. In addition to trying out some of these foods, you can always come in a talk with us about some seasonal symptoms you might be experiencing. We offer free 30-minute consultations here at Cloud Gate Acupuncture and Healing Arts if you would like to learn more.